Posted by Jace Stolfo on Wednesday, June 13th, 2012 at 3:12pm. 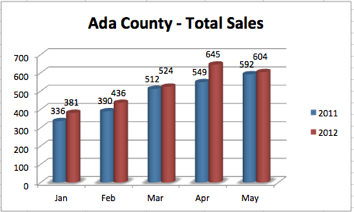 Ada County new construction sales have increased during the first five months of 2012 as compared to the same time period in 2011. 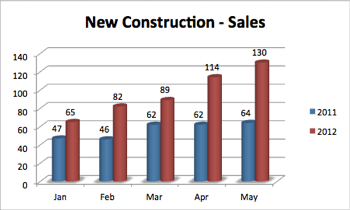 As shown in the following chart, new construction sales for 2012 are well above 2011 sales, sometimes by as much as 103% as recorded in May. While this statistic is significant on its own, it should be noted that this increase in Ada County Idaho new construction sales occurred with little or no increase in inventory over 2011. We see a similar trend in total Ada County home sales for 2012 over 2011. 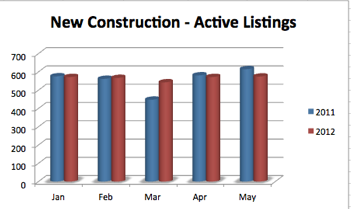 Total active listings for January through May 2012 were slightly higher than for the same time in 2011, though certainly not to the degree as the increases in Ada County new construction sales. As before, these increases in total sales occurred at the same time inventory was lower than the previous year. 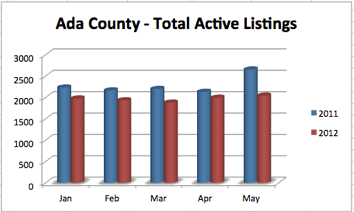 As shown in below, the total active listings for Ada County for January through May 2012 were consistently lower than the total active listings for 2011. This is not unusual, though. According to statistics provided by the Intermountain MLS, total active listings in Ada County per month have been lower than the previous year since 2008.